Not to be confused with World 7-2. 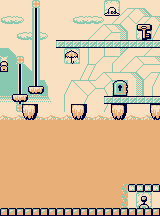 Stage 7-2 is the second level of the Iceberg of the Game Boy version of Donkey Kong. The level has water sections and introduces Ottō, sea creatures that can grab onto Mario, and Tododesu, walrus enemies that charge towards Mario upon sight. Mario starts off on a icy platform which is very slippery. Mario must enter the water then swim down to reach a switch while avoiding the Ottō. Mario must flip the lever to the left to activate the moving platforms, then enter the water again and swim back up while avoiding the Ottō. Mario must then jump along the floating ice towards the moving platforms, then ride them up to the icy platform where the key can be found on the right side guarded by a Tododesu. Once Mario picks up the key, he can defeat the Tododesu with it, then he must go back to the moving platforms and ride them down to the floating ice, then ride the ice over to the door on the icy platform, making sure he constantly jumps so the ice doesn't sink into the water causing Mario to start over. Once at the icy platform, Mario can unlock the door to end the level. Bag: Next to the moving platforms. Parasol: Below the ice platform. This page was last edited on September 7, 2018, at 02:34.